Hurray! I’ve rescued the pictures from the faulty memory card, so we can skip back and catch up with The Missing Episode! This is rather a neat little recipe, which makes a great quick supper. It’s full of flavour, quick, fresh, and (whisper it) healthy. A quick note on chicken, first – if you buy chicken portions from the supermarket, stop it right now. Dividing a whole chicken into portions is so easy, with a little practice it can be done in a minute or two. You will save money, and get better portions (the chicken breast portions you buy are woefully under-sized and over-priced compared with buying a whole roasting chicken), and also not be participating in the stupidity that sees the UK import white chicken meat from places like Thailand and Vietnam, while at the same time we’re net exporters of chicken leg meat. Madness. 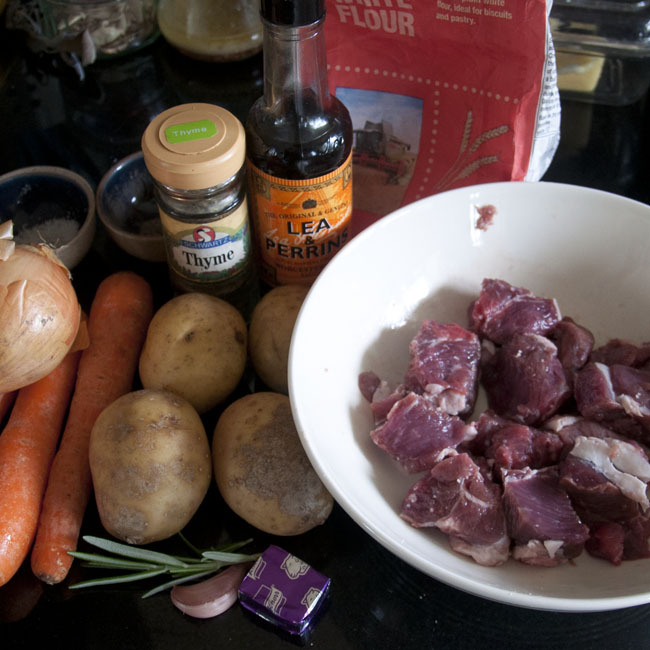 Right, rant over, and on with the recipe! In a bowl, coat the chicken breasts with the mustard, rosemary, crushed garlic, a pinch of pepper, a squeeze of lemon juice, and a little glug of olive oil, and set aside to marinade for half an hour or so, if you have the time – don’t worry if you’re in a rush, though, you can go ahead and cook straight away. I had two wings from my portioned whole chicken, so I put those in, too. The recipe calls for cooking the chicken on the BBQ (it’s an Australian recipe, after all), but for UK convenience, on a slightly drizzly evening, I chose to roast it in the oven. Preheat your oven to 180C. In a roasting tin or tray, arrange your chicken pieces. Once the oven is up to temperature, slide in the chicken, and roast for 35 – 40 minutes. 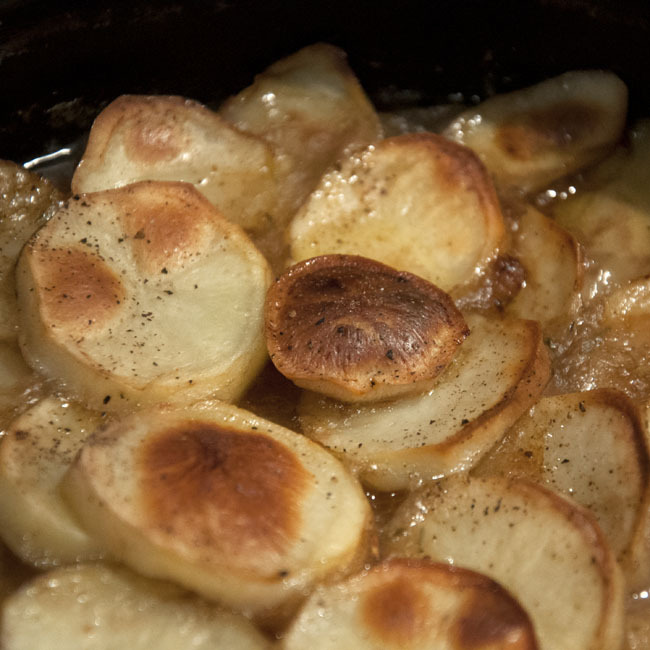 After about 10 minutes, cut your potatoes into bite-sized pieces (or use small new or salad-type potatoes, which you might just want to halve) and boil until tender. Drain, and mix in a good dollop of butter. Your potatoes can wait now with a lid on until the chicken is ready, which shouldn’t be long. Once the chicken is done, remove from the oven, and rest, covered loosely with foil. Pop the buttered potatoes back on the hob, and add the spinach to the pan with a tiny splash of boiling water. It will look like far too much spinach, but don’t worry, it will wilt down quite dramatically. Shake & mix the veggies from time to time, with the lid on, until the spinach is all wilted down. Season with plenty of black pepper, and a little salt to taste. That’s it, it’s ready to serve, with a slice of lemon on the side. There are some peculiar features to this recipe. Presumably they can be explained by the whim of the publisher, which is The Australian Women’s Weekly. I’m the last person to over-season with salt – I find it quite intrusive, if done to ‘cheffy’ levels – but the recipe mentions seasoning nowhere, and if you skip the black pepper, particularly, I think the flavours will be the weaker for it. I presume there’s a salt-avoidance rationale behind it somewhere. Likewise the recipe expects skinless breast fillets, which is bound to be down to fat-reducing, but compromises on flavour and texture for me. Make up your own mind! The combination of mustard and rosemary flavours works really well – I say this as someone who is not historically a great fan of mustard as a dominant flavour – and the chicken does go very well with the potato and spinach side dish. It was quick and simple to prepare but the flavours are big, fresh, and quite bold without being overpowering or unbalanced. This is healthy everyday food that doesn’t set off ‘diet food’ alarm bells. I recommend you try it! Soft cover (magazine binding), 120 pages, full colour. RRP £5.99. This is an odd little book, and one of a series. I can’t rightly remember how it came into my possession, whether it was a gift or a bargain bin purchase, but unlike many ‘collection’ books, it’s rather better than you might expect from the outside! As you might suspect from an Australian mass-market recipe collection around the turn of the millenium, it’s quite heavy on asian-influenced dishes without requiring a larder full of specialist ethnic ingredients; this makes it refreshinly easy to shop for in our local village Co-op! The food is light, fresh, and very suitable for summer eating. There are a variety of BBQ dishes which I will definitely return to during the course of the summer. The lack of seasoning follows through all the recipes, and can only have been an editorial decision. Fat and kJ values are given for the recipes, but the collection doesn’t appear to have been selected on this basis, which is refreshing! All in all, it’s a nice surprise, then. Better than expected. I wouldn’t suggest you all dash out and buy it, but if it happens to be hanging out on your bookshelf, perhaps give it another look? No elderflower champagne for me this year (*sob*) but I refuse to miss out completely on the floral bounty of the season. Last year I made a very small experimental batch of elderflower vinegar – just stripped some flowers into a Kilner jar, topped up with cider vinegar, and forgot about it for a couple of weeks before straining it and putting it back into the bottles it came out of. I was delighted with the results, which captured the fresh elderflower fragrance remarkably – even more so, if it’s possible, than cordial or champagne do. It was a tiny batch, so I had very little to share around, but everyone who tried it seemed amazed by it. I wasn’t really expecting to find anything, but The Forager’s Kitchen came up trumps – it has some remarkable infused vinegar suggestions, including violet vinegar (which is the recipe that first drew me in to this fabulous little book), so I shouldn’t really have been surprised I guess! Fiona’s elderflower vinegar is a fair bit more sophisticated than my efforts last year, with a double-infusion and the addition of a little lime zest. So here goes! Pick 30 your elderflowers on a warm, dry, bright (and ideally sunny!) day. Shake off any visible insect life, but don’t under any circumstances be tempted to wash them, as you’ll flush away all the beautiful flavour. Now you need to remove the tiny little flowers from the flower heads. Yes, I know it’s a pain, but sit down comfortably, and you’ll be done in about half an hour. Transfer all your tiny little flowers to a clean sterilised 2l jar, and top up with cider vinegar. Put the caps back on the empty bottles and put them safely to one side, you’ll want them again later. 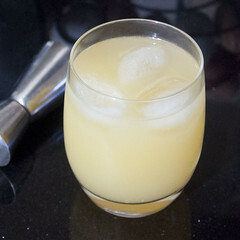 With a vegetable peeler, peel the lime zest in strips, taking as little of the white pith as you can, and add this, too. Seal up the jar and put it somewhere nice and warm, shaking occasionally, for 10 days. Don’t waste the rest of your lime, slice it up, and put it in a bag in the freezer. It’ll still go a treat in your gin & tonic! After about ten days, pick yourself 30 more flower heads, remove the flowers as before, strain off the vinegar from the elderflowers and lime zest, and replace them with the freshly picked flowers. I wouldn’t worry about really fine filtering at this stage, a normal sieve ought to be fine. Put the jar back somewhere warm and repeat the occasional shaking for several days. You’ll see that there’s quite a lot of pollen settled at the bottom of the jar. 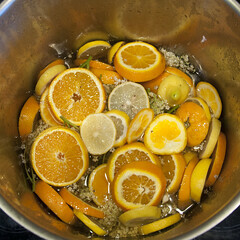 If you want a really clear vinegar, you’ll want to filter it finely before bottling. I suggest initially straining off the flowers, before passing the vinegar through a fine jelly bag or several layers of muslin. 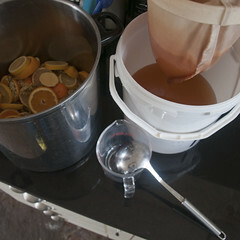 Once filtered, return the vinegar to the bottles it came from. I don’t bother to re-sterilise these, by and large, since they shouldn’t have had a chance to become contaminated since the vinegar was poured out, as long as they’ve been kept capped. Fiona advises using sterilised bottles, though, and she’s probably right! The vinegar will keep in a cool larder cupboard for at least a year, if you can make it last that long! Hard cover, 192 pages, full colour. RRP £16.99. This is such an incredibly beautiful book that it’s easy to forget what a great resource it is for wild eating! It covers a huge range of foraging habitats and seasons, hedgerow to coastline. There are plenty of foraging handbooks out there (I’ve reviewed a couple in the past) – what makes this book remarkable is the quality, inventiveness and sophistication of the recipes, all of which genuinely seem to respect and require the foraged ingredients. There is a freshness and originality about these recipes that I’ve rarely seen elsewhere and which makes me want to make them all, just as soon as I can wrap my grubby little forager’s mitts around the required ingredients! If you’re at all interested in wild food (with the proviso that it really is UK-focused, and probably progressively less use the further afield you might be) go and buy this gorgeous little book!